Inactivation of E-cadherin leads to invasive lobular breast cancer (ILC) that metastasizes to the gastro-intestinal tract, lungs and bone marrow, reminiscent of the human condition. An emerging theme in literature is the role p120-catenin (p120) in cancer biology. p120 regulates recycling of E-cadherin and data from our laboratory and others have shown that p120 translocates to the cytosol and nucleus upon loss of E-cadherin. In the cytosol p120 functions as an oncogene regulating Rho signaling (see below) and Kaiso transcriptional repression (see Kaiso page). We are unraveling the oncogenic signals that emanate from p120 in the cytosol, and performing genome-wide efforts combined with functional biology to identify p120/Kaiso targets in breast cancer. Based on these findings we are designing novel treatment regimens to target metastatic ILC. 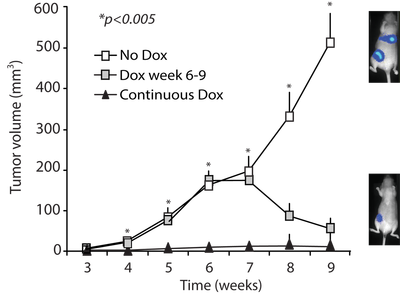 LEFT Figure: Cytosolic p120 expression marks tumor progression of ILC. 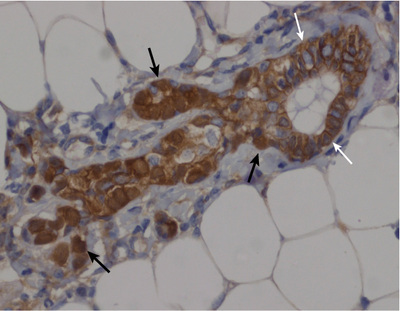 Invasive E-cadherin mutant cells showing cytosol and nuclear p120 (black arrow), versus normal luminal mammary epithelial cells (White arrow). RIGHT Figure: p120 controls ILC tumor growth and metastasis through Rho and Rock. Doxycyclin (dox)-inducible Rock1 shRNA-expressing mouse ILC cells were transplanted into the 4th inguinal mammary gland of recipient mice and tumor volumes were measured longitudinally in the presence or absence of dox.